SafeMinds is changing the conversation about autism. Less than 25 years ago in 1995, one in 500 of us was diagnosed on the autism spectrum. Now it’s 1 in 68 of us nationally. Since 2000, more people have been diagnosed with autism than the number of people who live in Baltimore, or Austin, or Washington, D.C.
Autism is an environmentally-induced epidemic. Many people with autism have serious but treatable medical conditions. It is imperative that research is used and brought to relevant stakeholders so that those with autism can be as safe, healthy, and independent as possible. 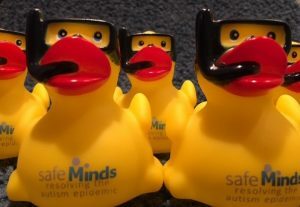 SafeMinds uses a rubber duck as a symbol of the need to stop ducking the autism epidemic, and instead acting with urgency to address the problems associated with it. A group of ducks is known as a team—which is exactly what the autism community needs. Join our team. Autism is an epidemic. For too many years, U.S. government agency executives have scratched their heads, questioning just how much of a rise there really is. They ignore peer-reviewed research proving that it’s not just better diagnosis, and that people with autism would not have been diagnosed with something else decades ago. The U.S. government still treats autism as a research project, with no measurable outcomes, accountability, or ability to leverage its collective resources. It’s time for the U.S. government to Stop Ducking the Autism Epidemic. Please help us advocate for much-needed change in our government’s response to the autism epidemic. Join our team. Autism is environmentally-induced. There is no such thing as a genetic epidemic. For decades, the U.S. government and other organizations have spent the majority of their research funds on genetics, rather than on environmental contributors, and on epigenetics—how gene expression changes over time as a result of environmental exposures. SafeMinds knows it’s time to Stop Ducking the Environmental Causes of Autism. Please help us promote environmental and epigenetic research. Join our team. 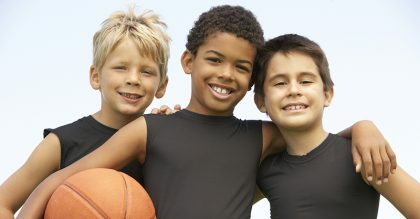 Autism complications are serious but treatable. The majority of people with autism have gastrointestinal disease. Over half are non-verbal. What if your child is in pain, but can’t tell you? Almost 40 percent of children with autism have a seizure disorder, as compared to one to two percent of the general population. Almost half of children with autism wander, similar to people with Alzheimer’s. What if your child wanders, misses his seizure medicine, and has a seizure alone? People with autism are nine times more likely to ideate suicide than their “typical” peers. Yet, there are no specialized treatments available to address this critical condition, either. SafeMinds knows we urgently need to address these commonly co-occurring conditions. Please help us to identify treatments for people with autism today. Join our team. 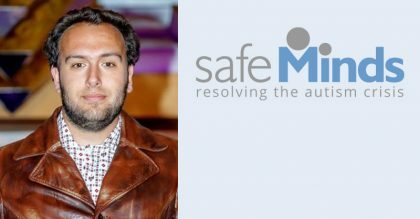 SafeMinds is working to increase the safety, health, and independence of people with autism. We must resolve the autism epidemic through advocacy, education and outreach, and research. Join our team.